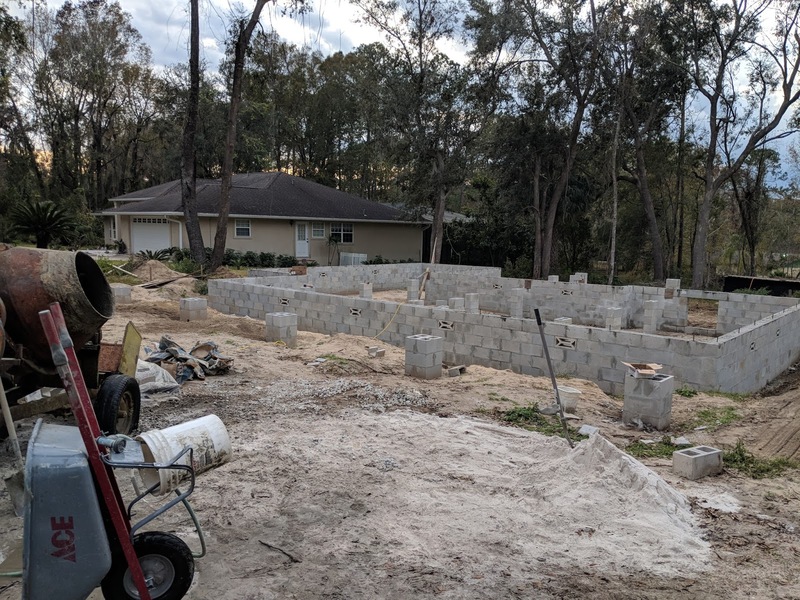 A DIY couple pursuing their dream to build their own home, brick by brick and out of pocket. 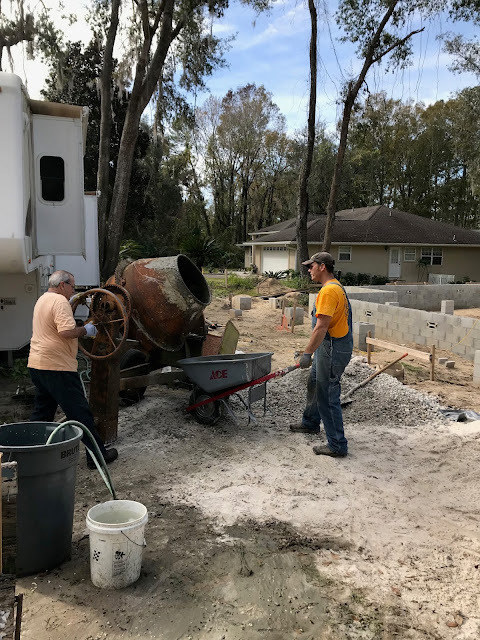 With the block finished, the next step was to pour the block with concrete - Chip worked several days on this part of the project and enlisted the help of co-workers and family. Manual and Chip preparing the cement in the mixer. 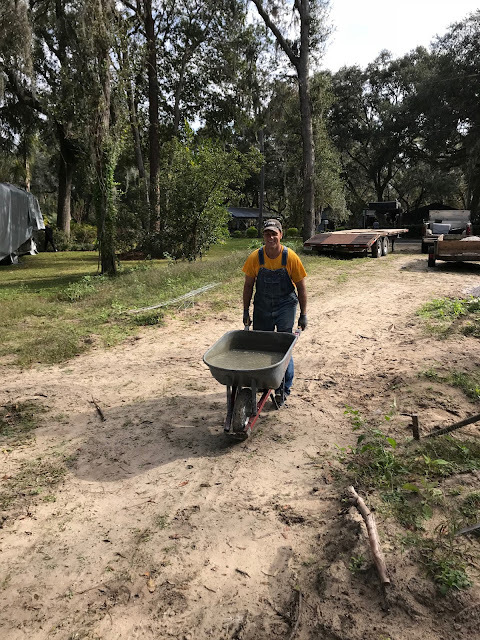 In attempting to not get too far off course, I want to share that the cement mixer in the picture is another ancient piece of equipment from Chip's dad's building days. Having access to this type of equipment is so helpful for without it we'd have to rent or buy the items. The rusty, old cement mixer may look like junk but looks are deceiving. The mixer needed some elbow grease to get it in working order; Chip replaced the carburetor and greased it and it was ready to go. Filling the cells in the blocks is a pretty simple task but it's a lot of work that involved hauling the concrete, which is loaded with small rocks, and lifting the mixture 4 feet high to dump into the cells, then repeating with each cell. The goal is to ensure the concrete completely fills each cell from the the bottom to the top of the stem wall. Pouring the concrete into the block. The scrap of wood laying atop and perpendicular to the stem wall in the above picture does have a purpose - it's used to level the concrete with the top of the block; it's nothing fancy but it did the job. As the concrete goes in so too does a J-bolt. This bolt is embedded 6" into the concrete leaving 4" sticking out at the top. The J-bolt is used in the next phase of building as an anchor to hold the wood that will lay on top of the perimeter of the house, called the mudsill. 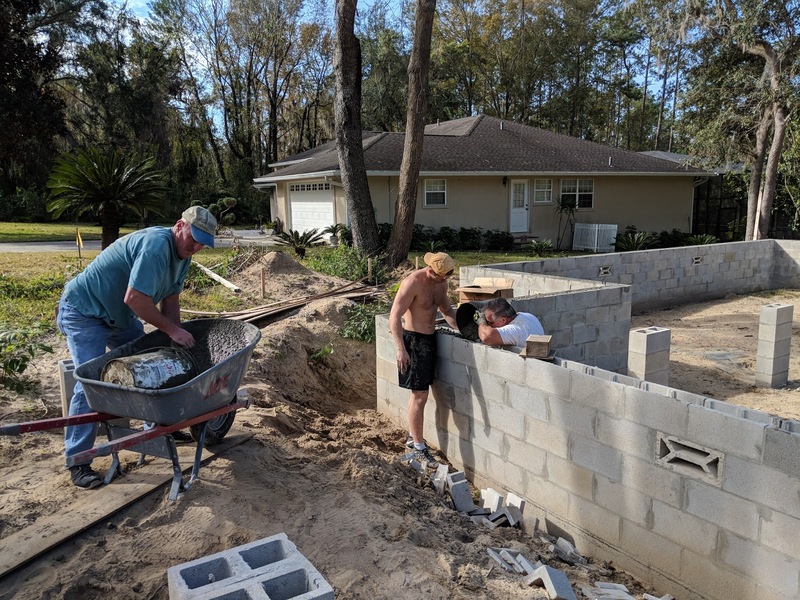 Ty, Austin and David working together to get the concrete in the cells at the front of the house. Finished with the days work. 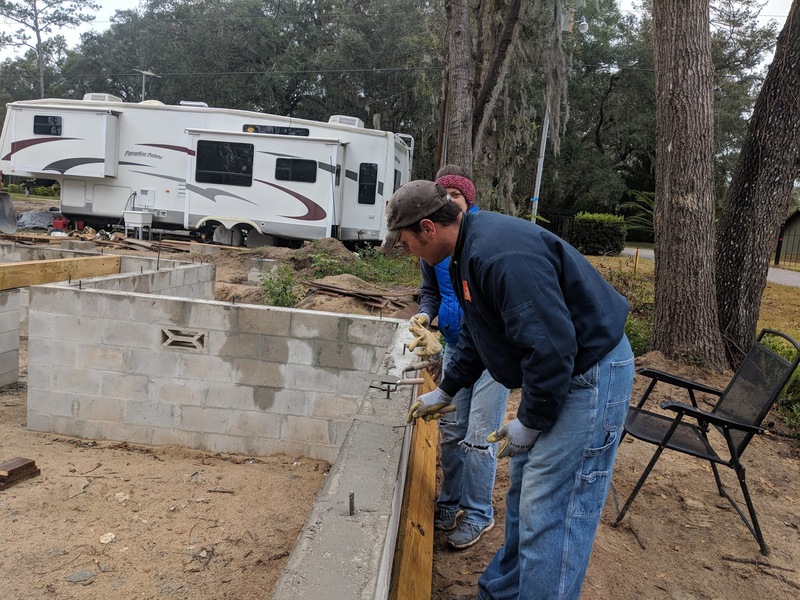 Concrete is still needed in the footers for the deck and porch. The nuts for the J-bolts won't thread on. Chip enters problem-solving mode and considers using his tap and die set to re-thread the nuts but we don't have the set on hand and will have to drive into Gainesville to pick it up. I suggest buying one at the local hardware store but the only 1/2" size is available as a set. Chip nixes that idea. Finally, we resolve to exchanging the nuts when 84 Lumber (our supplier) is open and we knock off for the day shortly thereafter, cold and frustrated with our lack of progress. A few days later, Chip realizes that he forgot to purchase and, as a result, install the termite shield. The termite shield is just metal sheeting that sits between the top of the stem wall and the 2x8's. The theory is that the termites will mosey on up the stem wall all happy, sniffing the tasty wood but then can't pass the slippery metal so fall off before they reach their feast. Anyway, our supplier orders the termite shield but the shipment is delayed. In an effort to save time, I drive to Jacksonville and pick up the 20 - 10' sheets so Chip can get back on track. Very seldom is a stem wall level all the way around so you must shim the mudsill (ensuring it's level, square and plum). In our case we can't just shim the mudsill because the termite shield is in the way. Chip informs me that we need to shim-up the stem wall with more concrete wherever it's not level, which is 90% of the perimeter. Chip sets to work and, when available, I help. The concrete in the forefront is wet, this is what we added, whereas in the foreground, the concrete is dry. The 2x8' on the ground is what Chip had installed but we temporarily removed to fix the leveling issue. One of the nasty, cold days but we didn't let that bother us. The lumber off to the left is the start of the girders. The photo above was a good day for us - we made progress, had fun and were ready for the next step by the end of the workday. For me, this stage of inspection brought to light that building The Floridian from the ground up takes an unbelievable amount of forethought and planning and that delays, like taxes, are inevitable. It's quite an adventure! I'm Pamela and I'm attempting to document the building of The Floridian (our future home!) 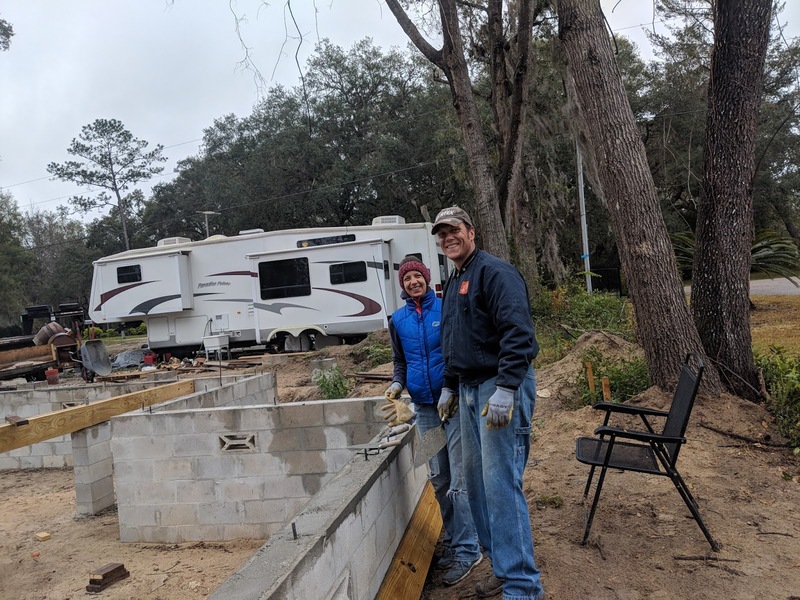 with my hubby, Chip, at the helm as craftsman and builder and me as his trusty assistant and sidekick.